is Red Bear Trading’s Big Jazzer in the Extra Heavy Gauge with grips and a speed bevel. It also includes Guthrie's Signature and his special feature. This feature is a serrated edge along the top of the pick, much like a U.S. dime. Guthrie describes the use of the serrated edge here. LIMIT OF TWO PER CUSTOMER PLEASE. Blown away by the difference this pick made to my tone. Pros: Perfect size, great tone. Just one word : fantastic, more than i expected when ordering. Very easy to get from France, with great customer service support. I have two of these picks because I fear losing one. 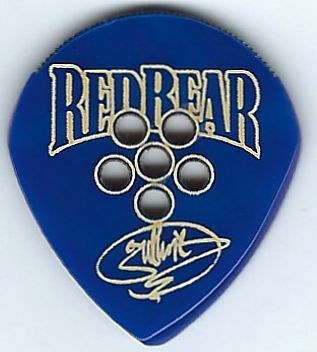 I have used a lot of picks since I started playing, having recently settled on a Jazz III variant. I decided to take the plunge on one of these and I am incredibly happy I did. These are wonderfully made, don't move around at all in your fingers regardless of how fast you play without needing a death grip on the pick. The tone is warmer, and rounder than the Jazz IIIs, which is exactly what I was looking for. I won't hesitate to buy several more, they are well worth it. Customer service was great too. These are fantastic! I find myself using this pick everyday. The tone it provides is brilliant and it glides effortlessly through the strings. A wonderful pick. It feels smooth against the strings, and it provides excellent tone. I haven't seen any wear after extensive performing. 5 stars without question!